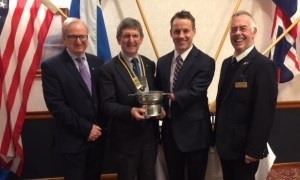 President John Spittal of St Andrews Kilrymont Rotary Club presented Mike Drever from Leven with the Rotary Quaich and a sports bursary as the club disabled sports person of the year on Tuesday 10th April. In his acceptance speech Mike informed Rotarians at their weekly meeting at the Scores hotel in St Andrews of his considerable progress in international Para trap shooting in the last year. In 2017 Mike finished 10th in his first GB international in Italy and this year he was just outside the medals with a fourth place finish in his second international in the United Arab Emirates. Mike detailed the challenges he faces as an arm amputee and outlined in detail the discipline of Para trap shooting. Mike paid tribute to his coaches and governing body Scottish Target Shooting who have taken him under their wing. Disability Sport Fife President Richard Brickley introduced Mike to club members and Rotarian George Donaldson, a great friend and supporter of DSF over many years, provided hospitality support on the night.